Known as an innovative publisher of Genre Fiction, Pro Se Productions announces the debut of one of its more inventive collections, one giving a particular type of writer the spotlight, shining a focus on young writers. Destinies Darkly Dreamed features stories written by high school students tackling action, adventure, passion, and betrayal in their own voices. Pro Se Productions brings daring new tales from new and young writers of Genre Fiction. Action. Intrigue. Passion. And More. A collection of High School students sharing… Destinies Darkly Dreamed. There’s a reason for the title. Some of the tales go into some very dark places and several of them deal with situations and choices and actions that many don’t believe that high school students think about or deal with. There is violence, there are relationships, there are questions of identity within this book that even society today may not be completely comfortable with confronting, but all of those and more affect these kids every single day. Not just the authors of this book, but high school students everywhere. The days of the gilded age of being a high school kid may not be gone, but they’ve definitely changed. And these stories are reflections of that and expressions of the way authors in this work deal with those issues- by writing, by creating. Destinies Darkly Dreamed from Pro Se Productions. “Although,” says Hancock, “the seminar was held by a high school, a high school I’ve visited since then and worked on various projects with, the stories you’ll find here were contracted for with the students and their parents. This is a work like any other book published by Pro Se Productions, an arrangement between the publisher and individual authors. I say that so you know that what you read are the expressions, thoughts, and ideas of the authors who wrote them and theirs alone. 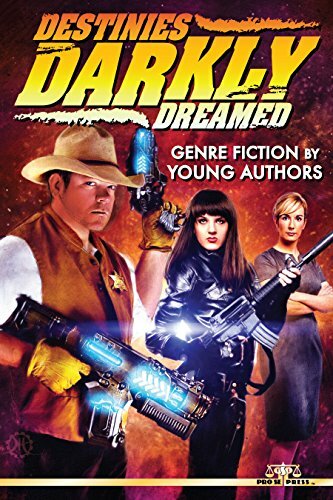 Destinies Darkly Dreamed: Genre Fiction by Young Authors features evocative artwork and logo design by Jeffrey Hayes. The print version formatted by Percival Constantine is now available for $12.00 via Amazon at http://tinyurl.com/pe6vy9x and at Pro Se’s own store at http://tinyurl.com/m5449hp. This exciting collection is also available as an eBook formatted by Russ Anderson for the Kindle at http://tinyurl.com/kbfg2sq and for most formats at http://www.smashwords.com/books/view/525620 for only $2.99. JOHNNY NICKLE RETURNS IN JAZZY DIGEST NOVEL- CHARLES BOECKMAN PRESENTS JOHNNY NICKLE IN TROUBLE FOLLOWS DEBUTS!